It isn’t Evers to Tinker to Chance. Those are names that don’t need the surname. Well, the last one is my sneaker. It isn’t meant to reference clothing or a dead president. This Calvin is Calvin Ayres. He is the hidden former owner of also ran Bodog. I can’t say Calvin was poker’s original bad boy. Bad boys in poker has been a cast of thousands back to the days it was spelled with a Q. But, he did grab attention announcing his billionaire status and lifestyle to be among the poker’s first to get Federal Attorney attention. That brought with it profiles in the slick paper press. That is our Calvin version– the self-promoting nouveau riche boy that never grew up. One of the beefs about his poker site has always been the software. Clunky doesn’t do clunky justice. So, you may or may not love his professionally maintained, rococo site called, modestly, calvinayres.com. 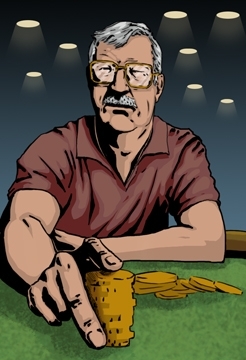 But, he does chime in to give his version of the winners and loser in the poker scene. I’m sure he’ll make your day just like he promised in the old days when Bodogers got to share the Calvin lifestyle; even if it was via crappy software.